On my projects, I always chamfer all the edges that anybody might ever touch, including the bottom and inside edges. Sharp edges are very uncomfortable to touch. Even a slight chamfer of less than 1 mm will make the piece feel much nicer in the hand, yet the chamfer is hardly noticeable at a glance. I chamfer the edges by passing a small palm plane over them at a 45-degree angle. I always use this little green palm plane that I bought from Lee Valley tools some years ago. I use it more than all my other planes combined. If I want more of a round edge, say of 2 mm radius or less, I often just make several passes with the plane at different angles. I also use the plane even if I'm aiming for more of a sanded round edge. Removing a bit of material from the corner cuts down on how much sanding I have to do to get the same effect. Edges that are rounded just a little bit is one of the things that sets quality furniture apart from the stuff made out of particle board. With just a thin layer of plastic veneer on the particle board, it's impossible to give the edges any sort of rounding without cutting through the veneer. 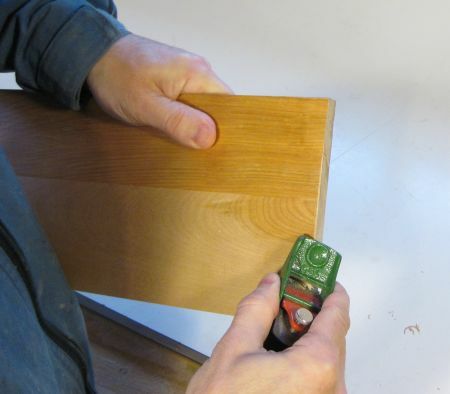 That's why cheap furniture usually has these dreadfully sharp corners and edges. It's all the more reason to round or chamfer the corners on your work - to set it apart from the cheap stuff.